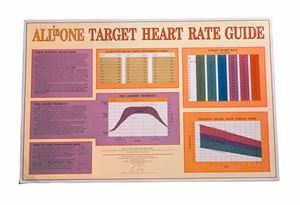 Through easy-to-read graphs and tables the ALL-IN-ONE TARGET HEART RATE GUIDE formulates the necessary information you need to determine an effective aerobic workout. Attractive full color 22 ½" x 34 3/4" poster. Also available in Stretching Pad and Individual Laminated Pad sheet formats.